I’ve aptly titled this blog post as “Gardening for Dummies” because we are just that when it comes to gardening; a couple-a dummies. But just like everything else we dive into, Google is always our best friend so we manage somehow. I love hydrangeas. Not just like…love. It’s been somewhat of an obsession lately because I’ve been dying to plant some at our house for about a year now. I think Andrew is getting sick of hearing me gasp every time we pass a house with hydrangeas while driving around town. I’m sick with hydrangea-envy. We have a pretty decent-sized garden at the end of our 2nd driveway that was a bit overgrown and messy when we first moved in. Thanks to our friends at Lawn Ace, we eliminated most of the weeds and any plants that were dead and dying. 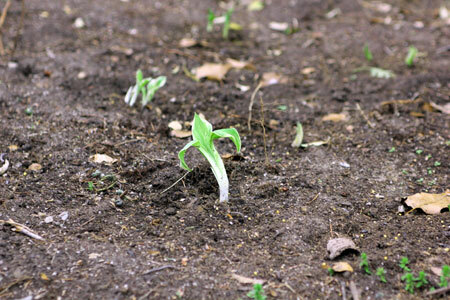 Once we had a clean slate on our hands, we worked in drips and drabs to get the garden back up and running again. We tilled the soil, dug up a ton of crazy roots that were growing all over the place and paid close attention to any plants that were still surviving. Our first real stab at gardening was taken a little over a year ago when we planted some hostas. 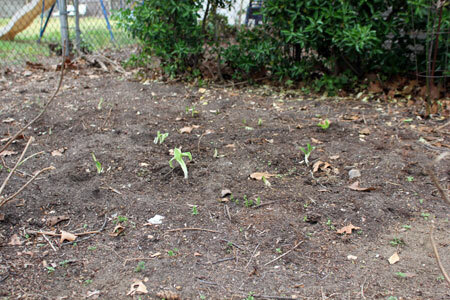 You can read all about planting hostas right here. We also added some black mulch to really make things pop. I’ve always been a fan of the way black mulch really accentuates landscaping and gardens. We also use Preen which includes weed control. Weeds definitely still make their way through, but not as much as they do sans mulch, so we are always pleased with the results. So that brings you up to speed with our gardening endeavors so far. Mostly cleanup and then a little addition with some hostas. A few weekends ago when we were shopping at Lowe’s we noticed plenty of hydrangeas for sale so we had to go for it. We bought two, one blue and one pink. I’ve seen hydrangeas take on this gradient effect with coloring so I’m hoping that these two eventually start making some blueish, pinkish, purple-looking flowers as well. I’ve also heard that hydrangeas are really easy to manage and easy to grow. In addition, the instructions that came with these two indicated that they should be planted in part to full shade…bingo. That’s perfect for a couple of novice gardeners. It seems like hydrangeas are really the perfect plant if you ask me. They are so pretty – I just love the vibrant colors – and they will supposedly grow just about anywhere. I think they also look great against the black mulch and they are also seemingly easy to take care of (knock on wood). I’m hoping we can make these last and, if we’re lucky, they will grow to their full potential which is about 4 ft. x 4 ft. That would be amazing. Clear enough space to plant your hydrangeas (about 2 – 4 feet on all sides is preferable from what we’ve read). Dig a hole about 2 times the size of the root ball (the plant food-laden ball of soil in which your store-bought hydrangea is growing). You will obviously need to remove the plant, attached to root ball, from the plastic pot it came in. Place the plant in the hole so that the top of the root ball it is even with the ground. Fill in around the root ball, tamp the soil and cover with mulch. It’s literally that easy. Enjoy! Do you have a green thumb? Maybe you could share some gardening secrets with us, or just let us know what your favorite kind of flower or plant is. Follow us on Pinterest to see some of our greatest outdoor inspiration and like us on Facebook to stay connected on the go!